The financial services industry is facing a crisis of consumer confidence. Only half of consumers trust financial service firms, and half of consumers say their confidence in the banking industry decreased last year. This trust gap, coupled with the commoditization of financial products at razor thin rates, has client acquisition costs at an all-time high. 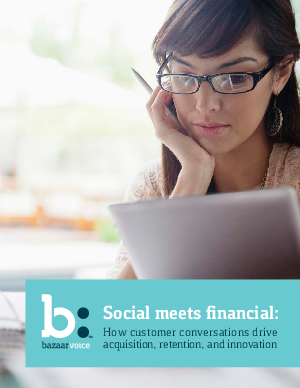 How can financial service providers win back consumer confidence? By facilitating authentic, transparent customer conversations, and acting on the insights uncovered. Consumers rate "listens to customer needs and feedback" as the most important attribute for financial service providers in building trust. And 38% read reviews online while making financial service purchase decisions. Download this free report for real-world examples from some of the world's largest financial institutions - American Express, Charles Schwab, Discover, Fidelity Investments, and more. Nationwide finds review readers are 40% more likely to start the quote application. LendingTree finds site visitors who view reviews start the loan process 83% more often. And USAA drove a 32-fold banner ad acquisition rate by including review content in ads. Learn how customer feedback helps card issuers, online and retail banks, insurance companies, and credit unions acquire new customers more efficiently, increase customer retention and lifetime value, drive innovation by uncovering exactly what customers/members want in a provider - while remaining compliant with industry regulations.